As you know, my least favorite blog to write is always the last one from the summer...which is why I've hesitated until tonight. 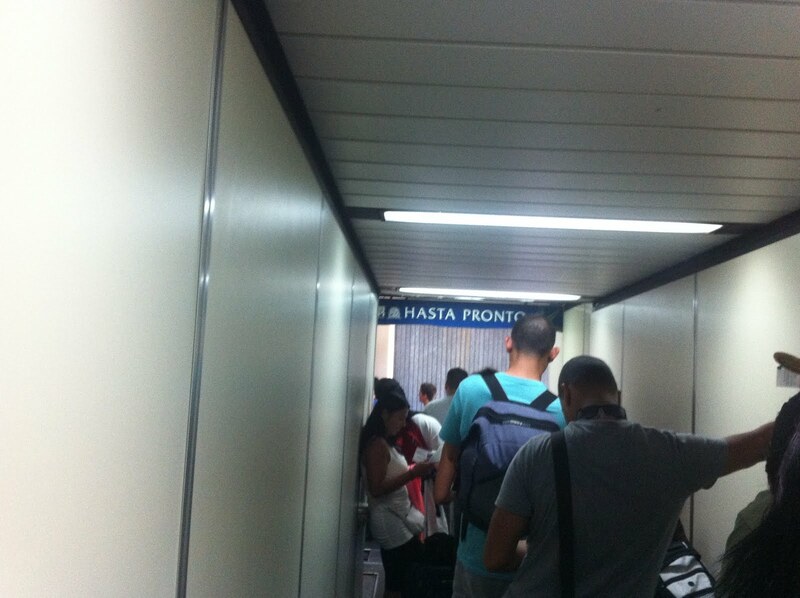 In addition, when I see the "Hasta Pronto" as I'm boarding the plan from San Juan, I always start to cry. This time, it had multiple meanings. Before I left this summer, I knew I'd be back as opposed to last summer, when I wasn't as sure. So in the days leading up to my departure, there was less sadness...as everyone knew I'd be back. But, my dear friend Ashley (from Nashville who is departing for Wales soon) told me before she left, she doesn't like saying goodbye, but prefers to say "see you soon." So, when I arrived at the departure gate and saw this....I realized the joy and sadness that accompanies the sentiment of "see you soon." Perhaps more importantly, I realized, some of my best friends are spread all throughout the world, but the kinds of relationships I've built with them...well, they are durable. I know despite our locations...I'll always see them again...and hopefully, I'll see them soon (Ashley, Magaly, Jorell, Eggie, Carlos...and the rest of you). My last week on the island was quite fantastic. No, it was perfect. I found myself repeatedly explaining to people how painful it always is when I leave. I'm not sure I can explain it here. I'm not sure I want to. But I do know this...every single time I leave, I feel like I've left something behind. I feel like I leave a place I belong, which is rather odd. I'm not Puerto Rican. I have no "claim" to the island (at least in the traditional sense), but I do know that it is the place that I feel the most at home. It is the place I feel most like myself, despite struggling through conversations and the complications of being in a world you haven't spent most of your life...I don't know what it is...but for me, Puerto Rico is home. I have family there. I have friends there. I feel right there. And while, you might think I'm dialing in some melodrama here...I've considered more times than I'd like to admit in the last couple of days considering leaving graduate school and moving there. (Disclaimer: Don't worry mentors and the like, if you help me get there, I'll stay in the program, which should be taken as a threat...maybe). I'll never be able to really explain it. And I actually don't care to do so...I know that when I'm sitting in a club/bar and I stand up to greet and embrace my friends on the island...or when I'm in the grocery store attempting to communicate about looking for a specific grocery item....or when I'm sitting at a party listening to a joke being told in Spanish and I'm carefully trying to translate...or when I happen upon some random individual who can talk with me for hours about my research...or when I watch the sunrise and sunset over the ocean...I know...I belong there. And it hits home with every text/message/email between me and my family when I realize my leaving doesn't just impact me...but we all feel it. 1. An early, exciting, and awkward morning awaking in Rio Piedras...then trying to navigate my way through the early morning streets of Santurce, drenched in sweat to arrive back home and attempt to sleep off the last several hours. 2. Proposing promiscuity/marriage to Ashley...and a life of freedom. 3. Making a southern meal for my family...homemade mac n' cheese, lima beans, green beans, cornbread, deviled eggs, and sweet tea. My absolute favorite part of the evening (and quite possibly the whole trip) was the hour I spent with Magaly, while I was cooking and we talked and laughed. That lovely lady is one of the best friends I have ever had. And then enjoying the meal all together. 4. A late night surprise visit to El Bar Bero with Carlos, Juanluis, Orlando...and the famous Sergio! It was a pleasure to meet Sergio...finally. I also enjoying getting to meet some of the bike crew in PR, particularly Jandy. And then drinking a bottle of something that looked akin to Pepto Bismol, but was really more like a Guava version of chichaito (#bad choice). The pictures are phenomenal. 5. Trying to get to Rebecca's birthday party in Old San Juan. Let's see...it started with me almost not attending. Then Eggie decided to go. Then Enrique didn't offer me a ride (Queeeeee?). Then Magaly asked me why I was speechless and we had a good talk. And finally I arrived. 6. Actually arriving at Rebecca's birthday party. The bands were rad. The venue was awesome. I didn't have a cupcake but they looked great. I got the chance to see my friend El Ochi (which I will always protect his first name). Late Night at the pizza place...meeting Milo and a ton of other Jawbreaker fans who took no offense to the fact that I played 10 dollars worth of Jawbreaker tunes on the jukebox. 7. A lazy Friday. Magaly made a delightful Tortilla de Espana (which I hadn't told her I had dreamed about the night before). We watched some episodes of Weeds and finally History of the World Part I....it might have only been better if we had not watched episodes of the aforementioned, but instead enjoyed some of the aforementioned and then watched the movie. 8. A Saturday afternoon in Old San Juan. While it was too crowded for my taste, I had the chance to meet a lovely fella from the student strikes in the 1970s...and then had the fortune of having trifongo at Fefo's and meeting Vity. I'm only sad I didn't get a chance to talk more with him. 9. 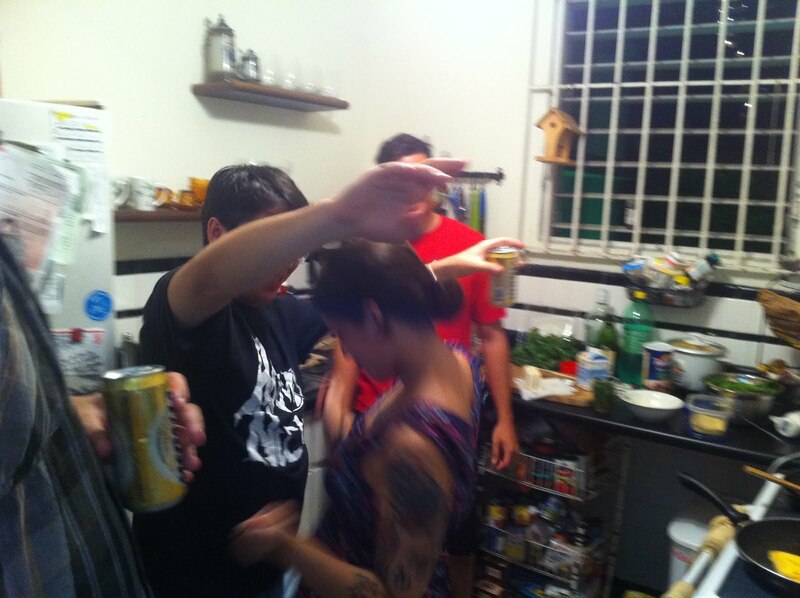 Naty's birthday house party. I met so many wonderful people...Jose, Obama (yes, the President), and some other handsome fella that I didn't catch his name. We talked about politics, the fact that Bud Light pales in comparison to Medalla, and other unfortunate experiences. It was a lovely party, indeed. Plus getting to spend more time with Jorell, Eggie, and Myrna was needed. Wait, maybe my favorite part was when Eggie asked me to be his own personal photographer (see the photos below). 10. The After-Naty's-Birthday-Party...a follow-up at El Boricua...handsome fella and friends in tow. 11. Watching the sunrise with Eggie after the party. 12. A lazy Sunday brunch. I might have died if Magaly hadn't prepared a delightful meal of french toast and watermelon (Mildred!!!). And some awkward family portraits. 13. A Sunday sunset on the beach...where I went to shed a few tears about leaving so the roommates didn't see. 14. Sunday night...having to say goodbye to Jorell and Enrique. 15. Monday Sunrise...sitting awake in my room, listening to the sounds of the neighborhood and preparing myself for leaving. 16. Monday morning and the drive to the airport with Magaly. I'm pretty sure we talked about anything possible to avoid the current sadness. We joked, we made small talk...because neither one of us could handle having to say the goodbye. Lucky for me, I warded off the tears until I got inside. Then...the lines were so annoying with los gringos that I wasn't able to cognitively understand what was happening until I arrived at the gate. 19. An intense crying fest when the wheels lifted off the ground in San Juan and I watched the island drift away. So, like Carlos has said, I'm Jack. I want to go back. I need to go back. The island wants me to come back. And until then, I'll have to tell all my friends and family there, "I'll see you soon, my loves." And I'll miss all of you every day, but I'll mostly miss my afternoon conversations with Magaly....well, and all those handsome men that seem a world away from me now. So, here we are. I've got 6 days left on the island. Next Monday, I return to Nashville. Then a week and a half later, classes begin again. And as if you didn't already know, I'm not overwhelmingly enthusiastic about leaving. Hell, I never am. Today, on the beach, my eyes got a little misty as I thought about that drive to the airport, the heat emanating from my sunburn, and the way my heart always sinks as the plane lifts off from the island. But I'll be back sooner than later, because I must. This past week has been extremely healing. I let go. I got my confidence back. I also found my groove in the most unsuspecting of places...and now, there is simply no comparison. 1. The unrelenting disappointment of Tropical Storm Emily. Other than "some" rain and losing the power for 20 minutes, Emily left us disappointed. I had hoped to fully enjoy a traditional puertorican storm party, but Emily dragged her heels and passed right by us. 2. Learning how difficult it is to find grants for fieldwork on the island given the colony status of the island. While this might not seem like a highlight from the week, the adversity fueled my fire again. It reminded me of just how important this research is to me-- personally and politically. And it will get done, no matter what happens. 3. I had a revelation about my personal relationships. Too many times, I've been willing to overlook a partner's lack of interest in the things that are the most important to me. For example, too many times I've simply shrugged off a comment like, "Oh, I don't really care about politics and stuff like that. I'm just not really political." I'm done with it. If you don't want to help start the revolution with me, I don't plan on taking my clothes off with you. 4. My attempts to convince Jorell that the drink Hot Toddy has incredible healing powers. Unfortunately, the only result was Jorell confusing the name of the drink and henceforth referring to it as "Potty Toddy" for the rest of the week. 5. Osvaldo Budet Melendez's art show at Galeria Nacional. I've been wanting to meet Osvaldo for a few months now, ever since I helped support his documentary on the UPR student strike. Here is a link to the webpage about the documentary. Not only did I enjoy Osvaldo's art, but it was great to finally meet him in person. 6. Also at the art show, I got the chance to catch up with some friends (Maritza, Diego, and Joel), but also meet some new friends (Mari Carmen and a couple of guys I met at the bus stop). Perhaps the most fun of the night was discussions about programming people in your phone as "Higher Power" and the girl talk that took place in the street. Absolutely hilarious and wonderful. 7. Spending an afternoon at Cafe Cultura with great music and a handsome barista. 8. Saturday Brunch prepared by Enrique. There is just almost too many funny moments to convey...the Supermaxx bags, the fruit, the 5-inch thick pancakes, the whipped cream, the 3-eyed mask...and well, the fact that brunch was announced at 10:30 and was served to the table by 2:30pm. Wait, maybe I'm exaggerating...however, it was quite delightful. And it was great to spend some time getting to know Rebecca. 9. A late Saturday impromptu beach trip with Magaly and Jorell. 10. Dinner with Magaly, Jorell, Diane, and Raul. 11. Pal Cielo with Eggie, Hommy, and Dilcia. I jumped into a dance party with some folks I didn't know. I was the only one to dance to Bailando. There was dancing in the street courtesy of Enrique, Rebecca and friends...also Eggie and Hommy. Then, in my classic style, I invited Eggie to hang out inside the apartment, then proceeded to fall asleep immediately, thus leaving Eggie locked in the apartment until Jorell rescued him. 12. Magaly's new-found obsession with the song, "Damn, I wish I was your lover..."
14. Getting Magaly and Jorell hooked on Weeds (yes, the show)...I really also liked it when Enrique blew the finale of the first season for them. Bad Enrique! 15. A truly Manic Monday. I finally got the chance to meet up with Marisol, a colleague from NYU studying here on the island, and her partner Jenny. I got to share a couple of beers with Joel and Cholo. And then, meeting up with Giovanni for drinks at El Refugio...and making new friends--Lourdes and Carli. It was the birthday of Lourdes and they invited Giovanni and I to join in on the celebration. There was chichaito. There was salsa dancing. There were pink flowers. We continued to celebrate into the wee hours of the morning. It was a rather wonderful Monday and a perfect way to begin my last week on the island. I sit here on this Monday night--exactly two weeks away from my return to Nashville-- with a slight sunburn. To be honest, I'm more upset about the mere 14 days I have left here than I am the sunburn. Generally, before I leave I try to take in as much of the sun as I can. I know, I know. It's not good for me, but to be honest, when I leave the island, I like to take some of it with me in a physical manifestation. So in the days I've returned to Nashville, I can continue to feel the warmth of the island on my skin. Yep, I'm a total dramatic sentimental about having to leave. Most of you know how difficult it was last year for me...and I don't suspect it'll be any easier this year. This past week was quite interesting. Not only was I far more productive than I've been in months, I also was far more productive in spending time with my friends and family. Thus, it is difficult to start to concern myself with leaving, particularly when I feel like I just hit my stride. Yes, this is why I need to be here longer than simply six weeks. So, in reference to this past week-- I'm sure it is no surprise for you...but there is nothing more that I love than kitchen dance parties and unexpected early morning parties on the beach. And that was exactly what happened. 1. Unexpectedly, I had five great interviews last week. What I find the most exciting is how generous people are with their time and how excited they are to talk with me about my work. One of my interviewees actually contacted me the day after the interview requesting a follow-up because there was so much more they wanted to tell me. 2. Enrique's confusion about the lyrics to the Violent Femmes song Blister in the Sun....when he sang to us repeatedly, "Let me go out, like a twister in the sky, let me go out....." Que fantastico. 3. Moving on and moving up. 4. Missing the soul dance party, but making plans to have a redux in Rio Piedras this upcoming week with a new friend. 5. My weekly phone dates with Ashley (Ludman), while laughing and recognizing the whole mess of trouble that one particular text message implies. 6. Being a flaneur on my walk to the train station at Sagrado Corazon on Thursday and on my walk down Calle Loiza today to find the post office. Though sadly, finding the post office is an indication that I'm starting to think about sending some of my belongings back to Nashville. 7. Ashley's diagram of the whole process from man to devil in disguise. 8. Michelle sending me a picture of our tickets to the see the Atlanta Braves in September. Wooot! 9. My discovery and first, second, third, fourth, and fifth visits to turntable.fm in the past week. Yes, folks, I've got a new addiction. 10. While in my pajamas on Thursday night, receiving a phone call from Carlos inviting me to go out to El Bar Bero with Orlando, Juanluis, and Giovanni. The evening was quite fantastic. Carlos forced me to order a bottle of wine in Spanish. Then the bartender informed me I was the first person to ever buy a WHOLE bottle of wine. Then, shenanigans at the SuperMaxx, followed with a late, late night/morning on the beach with a whole bunch of Medalla. A wonderful evening. 11. Followed by a wonderful hangover on Friday....only to be cured by a trip to the overly touristy Mexican restaurant Tijuana's with Jorell...and then more turntabling. 12. Followed by a late night conversation that can only be summed up by saying this: dot dot dot. 13. Waking on Saturday to discover that Diego was joining the family to celebrate "the last Saturday of summer" for Magaly and Jorell. Diego and Magaly cooked up a super fantastic dinner. Magaly made us the most delightful basil mojitos. 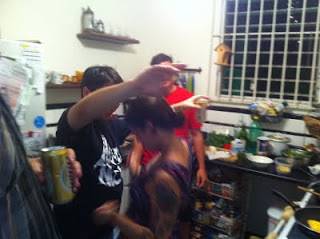 There was several kitchen dance parties. We watched Weird Science, though I think everyone was too intoxicated to gather the specific details of the "science." And then onwards to Nellylandia with Eggie, a fantastic rock show at La Repuesta, then back to Nellylandia to see Diego and Jorell. While everyone was obviously quite intoxicated at that point, when I heard Diego speak English to me, I was sure that I was more intoxicated than I thought, but I wasn't. 14. Waking up late on Sunday to discover that Diego was making brunch for the family. Gosh, I wish I could remember the name of it now....because it was just what we all needed. Then spending a lazy Sunday afternoon watching countless episodes of Mad Men with everyone. 15. Chepi Fest in Rio Piedras. Getting to see lots of friends, in particular Ronald and Milannie. But I suppose the most shocking event of all was when Jorell became the Incredible Hulk and proceeded to rip his jean shorts off of his body while singing. 16. And well, the beach. Because it really is so lovely. Here are the photos...and I'm saving a couple of key videos-- one of Enrique performing "Twister in the Sky" in the living room and the wild dance moves of Jorell and Magaly in the kitchen-- for a sneak attack...one day when everyone has forgotten that I have these videos....Ja!